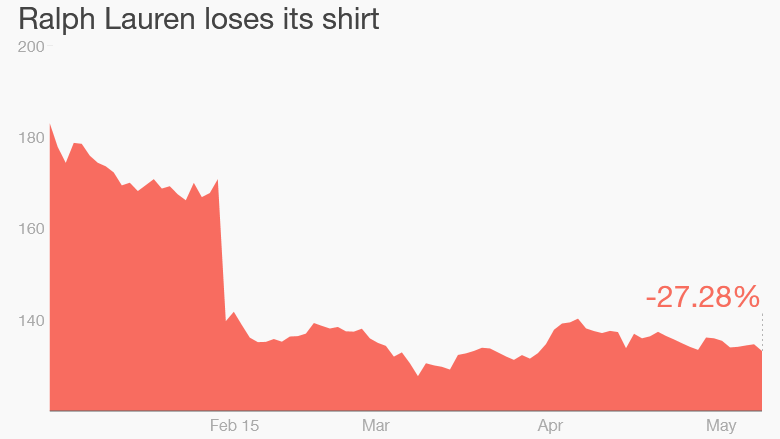 Ralph Lauren is one of the worst performing stocks so far in 2015. Does Wall Street know something the rest of us don't? At first glance, a selloff seems unwarranted. America's iconic polo emblem can be found in plenty of people's closets. The brand just opened its first stores in Brazil and the Philippines. In September, Ralph Lauren will open an "uberluxe" store in Milan for VIPs, which is getting a lot of buzz. The brand still has cachet -- celebrities continue to showcase the designer's high-end gowns on the red carpet. Kim Kardashian recently posted a photo of her husband Kanye West having dinner with "his idol Ralph Lauren" at the Polo Bar in New York City. But something isn't quite right in Polo land. Ralph Lauren (RL) stock is down almost 30% this year, making it the third worst performing stock in the entire S&P 500 -- the index of America's biggest publicly traded companies. Blame competition and millennials. There are tons of brands that make athletic gear now that people can wear at the gym, to the office or around town. The trend has been dubbed "Athleisure." Related: Can 'lumbersexuals' save Land's End? Under Armour (UA) is a particularly fierce competitor in the golf shirt space. A quick scan of Amazon.com (AMZN) reviews shows that many Under Armour golf shifts often have 4.5 or 5 star ratings while many of Ralph Lauren's classic shirts have only 4 stars. Young people are generally not fond of stodgy logo clothes. "Mlillennials like to look for brands that are more undiscovered and can set them apart. They like to be more nonconformist," says Erinn Murphy, a senior research analyst on fashion brands for Piper Jaffray & Co.
Ralph Lauren's growth has slowed considerably from its heyday in the 1990s and 2000s. Americans just aren't spending as much right now. Most Wall Street analysts have "hold" ratings on the stock -- the C grade of the investment world. America will get another look at how the company is doing when it releases its latest financial results on Wednesday morning. Rebooting Ralph: For Ralph Lauren to get back on track, it needs to get three things right: e-commerce, its accessories business and its Asia expansion, says Murphy. The company is playing catch up to its peers on e-commerce and is investing heavily now. Similarly, handbags and other accessories can be big money makers, but competition is intense and Ralph Lauren has traditionally been seen as a men's brand. "A quarter of their business could be accessories if they could get it right," says Dave Weiner, a senior analyst at Deutsche Bank Securities. At the moment, it's under 10%. Asia seems like the easiest win. "They have a lot more runway to go in Asia and China," argues Moringstar analyst Paul Swinand. Compared to elite brands like Prada and Louis Vuitton, Ralph Lauren is only starting to get more exposure there. 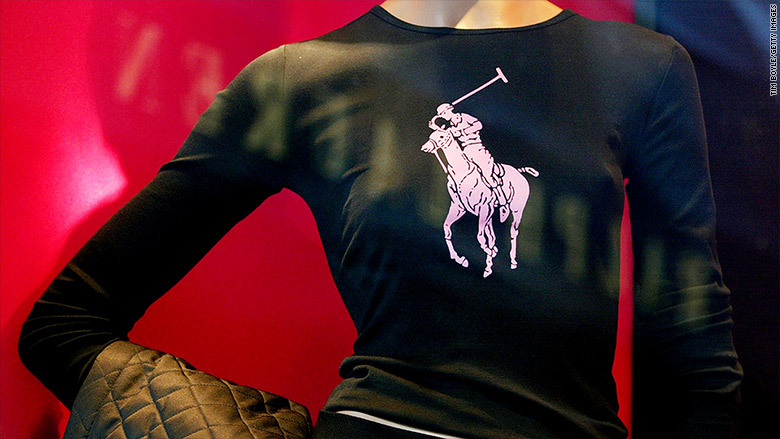 A third of Ralph Lauren's sales now happen outside the United States. Overseas expansion will help growth over the long term. But that's not much help in the short term as the European and Asian economies struggle to regain momentum and the strong U.S. dollar makes profits earned abroad look puny when converted back into dollars. No one is saying Ralph Lauren is likely to go the way of Liz Claiborne, the brand that tanked in 2006 after it started making clothes for J.C. Penney (JCP) and upset its long ties with Macy's (M). "I don't think they're down and out," says Swinand. But the polo pony is looking tired.